One of the Prince William County police officers shot while responding to a domestic violence call in Woodbridge has been released from the hospital. Officers Jesse Hempen, 31, and David McKeown, 33, were shot and injured Feb. 26, and their colleague, Officer Ashley Guindon, was fatally wounded during her first shift on the job. Hempen has now left the hospital, according to a post by the Prince William County Department on Facebook. 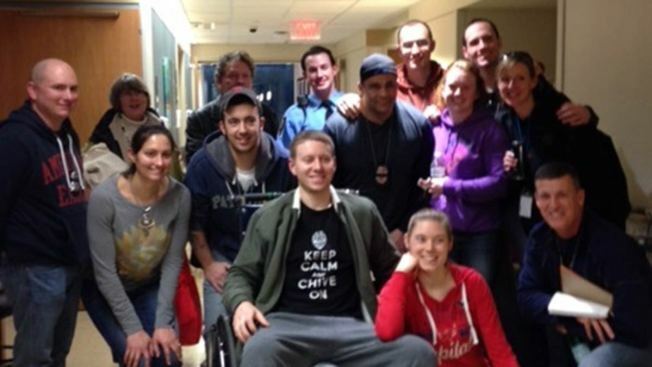 "Officer Jesse Hempen was released from the hospital last week and is at home recovering," the department's post read. Police said Hempen is in good spirits and he and his family were very grateful for the support they've received since the shooting. "We are continuing to ask for support as Jesse and David's recovery progresses," police posted. Suspect Ronald Hamilton, an Army staff sergeant, has been held without bond in the shooting. His wife, Crystal Hamilton, 29, was found dead in the couple's Woodbridge home after the officers were shot. Prince William County Police say Crystal Hamilton called 911 on the evening of Feb. 26 after getting into an altercation with her husband. Investigators believe she was killed before the officers arrived. Ronald Hamilton then confronted and shot all three responding officers when they approached the couple's front door, according to court documents. Guindon died of her injuries. McKeown and Hempen were rushed to a hospital. The Hamiltons' 11-year-old son was also home at the time of the shooting, but wasn't injured. Police Chief Chief Steve Hudson had said in the wake of the shooting that the wounded officers were being treated at Inova Hospital, and both had a long road ahead for their recovery. A Public Safety Appreciation Day was held Saturday, with some of the proceeds going to an injured officers fund for Hempen and McKeown.